Alkyne reactions typically mark the turning point between basic organic chemistry and this just got real! This video provides an introduction to what you can expect when studying alkyne reactions. From their basic chemistry and properties to the various alkyne reactions. 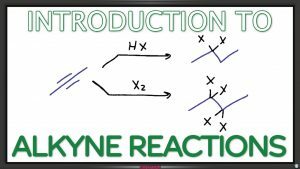 This is Video 1 in the Alkyne Reactions Video Series. Click HERE for the entire series. Don’t forget to follow along with the Alkyne Reactions Cheat Sheet!